(CNS): The crew of a missing fishing boat were all found safe and well by emergency services on Friday afternoon when the police helicopter spotted the vessel some 60 miles south west of Grand Cayman. 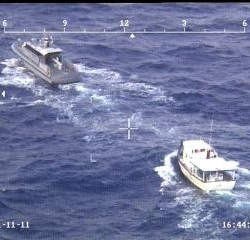 The Joint Marine Unit boat, Cayman Guardian, was sent to the location torescue the occupants and the boat. The King Bal One was was reported missing to the joint marine unit at about 10.35 on Friday morning after it had apparently run out of fuel on Thursday afternoon when returning to Grand Cayman from Table Top Bank. The vessel also appeared to have lost battery power, the police said. Following the report of the last known position of the boat some 34 miles south west of Grand Cayman, the RCIPS Air Operations Unit began a search. The fishing boat was spotted by the helicopter crew at around 1.30 in the afternoon some twenty-four hours after the boathad begun drifting at sea, and sent the Cayman Guardian to rescue the men and the boat. The King Bal One was expected to be towed back into harbour early Saturday morning. Shouting "Apply Costs to Owner/Captain" afterwards is unreasonable, as in they wont be able to pay so no one will do it. What we should be asking for is that 'avoidable rescue insurance' is required for commercial (long range) fishing vessles. Then if a rescue is needed there is an avenue to recoup costs. Don't want to pay your premium, or can't pay it the year after you get rescued, then you can't get your licence. Its a simple bussiness decision. Make sure that there is no 'avoidable' reason for your rescue and your insurance doesn't kick in and your costs (theoretically) stay low. – What we need is pre-emptive solutions, not 'pay later' calls for 'fiscal revenge'. Of course, this all raises the societal discussion that is needed to agree on when we, as a community, will pick up a tab to rescue people and/or property and when we expect people to look after themselves. There is a good argument that some level of 'public safety' is expected. We just need to agree in advance where it is and then everyone knows what they'll have to pay for themselves. I could see this not being an issue if the boat ran out of fuel closer (say 1mile or so) to the islands, or inside the reef, however, this craft was 34miles from shore – that reeks of terrible judgement by the Owner AND the Captain. Captain should be charged with reckless endangerment of the lives of the crew and lose his rank and license. Also, didnt they have satellite phone? If so, why make the report that they were "missing" instead of out of fuel? Doesnt King Bal One have just one engine? This is a disgrace. The owners just be made to foot the bill. They put lives at risk by requiring the emergency services because of what looks on its face a serious of decisions that were cheap and meant the vessel should never have left the shore in the first place. And for the poster saying "Don't blame the Captain", of course it is also the Captain's fault. He is obliged to check these factors before putting his crew at risk. The ability of this Captain to operate a vessel must be seriously put into question too. Other fishing vessels in port could have gone to the rescue of King Bal much sooner, but would have required payment for their fuel and time. Obviously, the owner decided it would be much cheaper to use the Police launch and helicopter. It is alway up to the captain who are driving any transport, plane, train, cars, trucks, they have responsible and final say not the owners. Same as you it is up to you when you drive a car it is roadworthy or not. This captain must be crazy and stupid go out on low fuel to risk his life for couple hundred dollars less worth of fuel!!! It is about time for all boat captain, private and commercial boats to be trained and hold license like rest of the world. Also retrain and renewal license every 3 years this will save people lives and time. strange after all the expert marine training people in cayman get! The JMU (Joint Marine Unit) were sent to rescue the KBO (King Bal One) because it was reported as missing to the JMU when it was returning from the TTB (Table Top Bank). This is a good business strategy, lets go fishing without enough fuel and get the government to come get us with a cost of about 9000 dollars; saves me 1000! Govt has to start enforcing "we will save the people but not tow the boat" , or recoup costs on the rescue and sea tow; it shortens the life of the vessels and the MU Get blamed for destroying them too quick. Ran out of fuel and lost battery power? I hope they impound the vessel until the owners pay the costs of the rescue. I hope the idiot "captain" gets the bill!